We had 8 rounds of 3 + 2 blitz last night. Top score (7/8) to Prashanth and Richard in the adult division, and top score (7/8) to Sean and Joel in the Junior division. Blitz again next week, six rounds or 5 + 3. Guests welcome. We will have a Swiss blitz tournament next week of six rounds. Depending on numbers we will probably have an older players and a youngsters division. Guests are welcome. Come along and join in the fun. Doors open 7pm, The blitz will kick off at 7:30. Dont be late. The club welcomes Michael Serrate as its newest member. Michael will be a valuable addition at the strong end of the club spectrum: he has played 13 ratable games so far and enters the ratings board with the rank of Rook on a very respectable 1604.Welcome Michael. Seventeen last night for a mini round robin in three divisions. A few false starts at the end but things eventually settled down to 3 games at time control 10 + 0. Special mention to Richard Jackson, Dhusar and Sean who all manged a clean sweep of their games. Round Robin Popular. Graham and Sean Top Score. 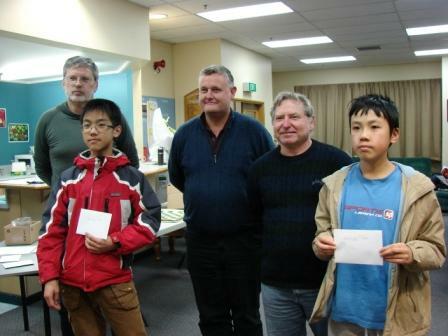 Forty eight players turned out for the Waikato Open on the Weekend, which is a local record. The open section had 23 players. First was Michaeal Steadman on 5 points, followed then by a six way tie on four points between Russell Dive, Robert Smith, Ben Hague, Daniel Gong, Layla Timergazi, and Alphaeus Ang. Twenty five played in the under 1800 division. Sivaram top scored on five, while Ian Kennedy and Aaron Wang shared second equal on 4.5 points. Final crosstables are here, and this is the rogues gallery. Thanks once again to Gary for organizing the venue, and Keong Ang for a stirling effort as arbiter. This weekends Waikato Open looks to be our best ever, with 47 confirmed entries so far, including 7 FIDE titled players (6 FM, and an IM). Registered players can be seen here for the open division, and here for the under 1800. We look forward to seeing you there!